The Euro dropped to 1.1250 as the rising US Dollar across the board was the highlight of yesterday’s trading session. Euro-zone Industrial Production falling more than expectation (-0.9% vs -0.4%) added more pressure on the Single currency. Earlier this morning, German GDP (QoQ) missed the estimates (0.0% vs 0.1%), showing no growth in the last quarter, adding fears that the German economy could be staring at a recession. Looking ahead, traders will shift their focus to the Euro-zone GDP figures, as well as to the US Retail Sales and PPI for any directional clues. 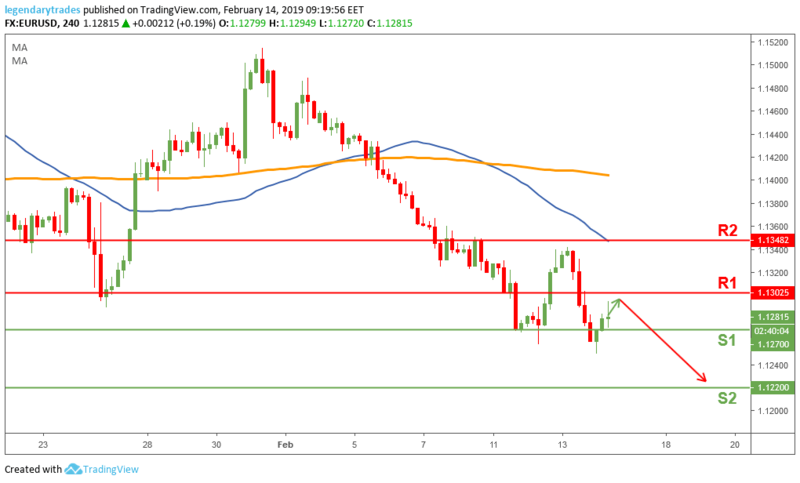 The Euro bears took back control in yesterday’s session taking price towards 1.1250 after facing a minor support level. Price is currently trading between 1.13 (R1) and 1.1270 (S1), we need to see a break to either side to confirm the next possible trajectory. A successful break below 1.1270 (S1) could possibly take the price towards 1.1220 (S2).